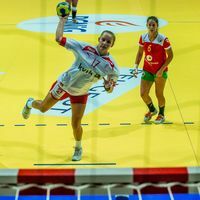 30 young journalists are being invited to taking part in a European Union funded project during the Women’s 17 EHF European Championship taking place in FYR Macedonia 13-23 August 2015. The project organised by Mladiinfo International in conjunction with the Macedonian Handball Federation is offering young media professionals aged between 18 and 30 years of age from 15 countries the chance to join the European Voluntary Service (EVS), which is part of the European Union's Erasmus+ programme. Participants will spend 40 days in Macedonia (22 July–31 August 2015) with the opportunity to gain an insight into sports journalism and multi-media and produce articles and other multi-media content during the course of the Championship and will be published on a website, which will be run by the participants. All costs for participation (accommodation, pocket money, travel to/from FYR Macedonia) in the project will be covered for the selected volunteers. Further information is available on the Mladiinfo International website. Deadline for applications is Wednesday, 25 February 2015. Applications are invited from the following countries: Romania, Spain, Portugal, Germany, Belgium, the Netherlands, France, Poland, Slovakia, Czech Republic, Croatia, Austria, Montenegro, Serbia and Slovenia. There are a maximum two positions available from each nation.